I'd been hearing rumors that it's possible to get WhatsApp messages and write them on the computer. I really wanted it, because sometimes the messages are so long, it's hard to read them on the tiny screen. And when I'm home in the den, I sometimes don't have my phone with me. Also, it's so much easier for me to type longer messages, especially in Hebrew, on my computer keyboard. One of the reasons is that I learned something really great in JHS 74, when in the 7th grade. It's called touch-typing. I don't need to search for the letters. My fingers were trained, over half a century ago, to know where they all are. And I've even taught myself, meaning my fingers, where most Hebrew letters are. But it's so much harder to type on a phone screen, even when the phone offers suggestions, trying to read my mind. 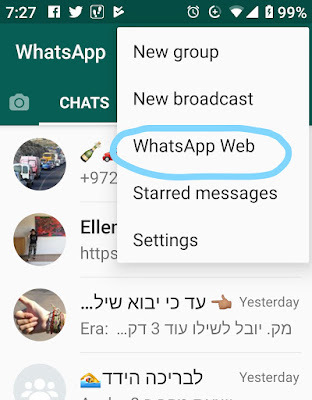 Finally, last night, when the Jerusalem "Big Blue" Lions decided to start a fan WhatsApp group before the big game* tomorrow, it posted instructions on facebook how to put the app on your computer. So I did it! And now I'll share the news. 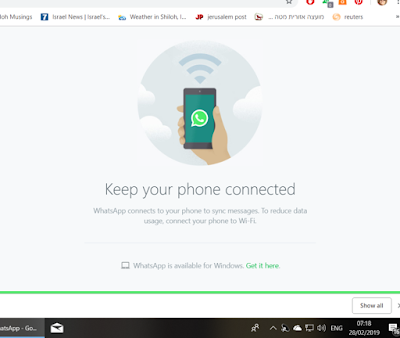 From the computer, click WhatsApp, and follow the instructions. From your phone, go into WhatsApp, then click the 3 dots in the upper right hand corner, then WhatsApp Web, and follow instructions. *Tomorrow, Friday March 1, 2019, the Jerusalem "Big Blue" Lions are going for their record breaking third Israbowl National IFL Tackle Football Championship in a row. Yaala Big Blue! Suddenly I got a hankering to make cupcakes. I hadn't made any for decades. In those days I needed a special cupcake tin and little paper things to keep them from sticking. When I "purged," threw things out before the crew came to renovate my kitchen, those old pans were sent off. Don't worry, I didn't get upset that they're gone when I decided to make cupcakes. Now it's much easier to make them. You can buy self standing disposable aluminum or paper mini-tins. 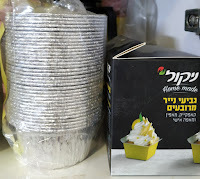 Theses disposable baking "tins" are the perfect size for cupcakes and not very expensive. I used the aluminum ones, which have been waiting patiently in the closet for years next to the paper cupcake tins. 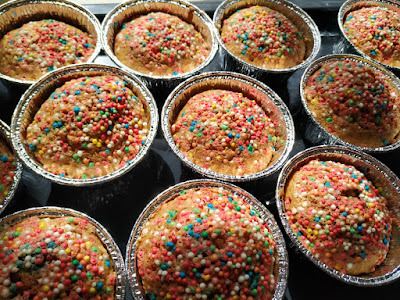 I placed a bunch on a large baking tray and poured in the cake batter. "What batter?" You're probably wondering. I used my super easy TNT one-bowl cake recipe. I've been making it for almost half a century, and nowadays I barely measure. I added chocolate chips to the batter and decorated them with colored sprinkles. Honestly, you can't get easier than that! Maybe I'll bring some to THE GAME for the kids and grandkids. Yaala Big Blue! When I was young, I'd been curious about family stories, family roots, but nobody ever really talked to me about them. My father's father had passed away before I was born, and in the 1950's it seemed that everyone had their eyes on the future, rather than the past. On my mother's side she had no aunts, uncles or cousins. My father had been involved with many of his cousins, and the David Spiegelman Family Circle got together periodically. We even had picnics in Kissena Park, Queens throughout the 1950s, which I always enjoyed attending. The other day I got an email from second, or whatever distance, cousin with photos of our mutual great-grandparents' gravestones. A careful reading of the gravestones gave me a bit of "surprising" information. To strengthen this story is an additional one about a cousin of my grandfather, who had been given the same name, but changed his last name to "Spears," possibly with different spelling. This Harry Tzvi Hersh Spears had been a movie producer in the early days of Hollywood, according to family legend. Not all of my Spiegelman cousins are involved in this effort to research our family, but enough of us to make it very exciting. *My branch of the Spiegelman clan seems to have left Nasielsk, Poland in the very early 20th century, well before the Nazis invaded. My great-grandparents both died in New York. From what we know now, not even cousins remained in Nasielsk, and Glenn Kurtz who has taken on the project of researching, repairing and conserving the history of Jewish Life in Nasielsk has found no record of donations from my family after World War Two. I generally like beer when I have the opportunity to drink some. OK not all beers. I prefer darker with strong flavors. 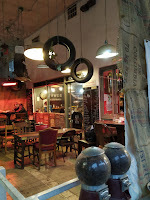 For the past few years, I've been mentored by Doug, the Beer Maivin, in the culture of Israeli craft beer. I'm even on his "tasters panel." 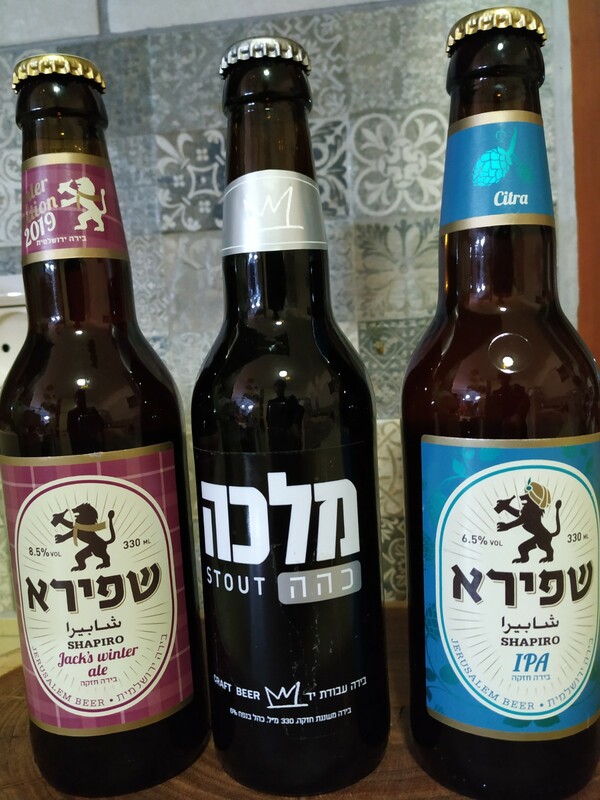 We almost never have beer in the house, because I want to patronize only the Israeli craft beers, and they aren't sold locally. The best place to buy it is in the shuq, Machane Yehuda, and since bottles are dangerous/difficult to carry, and I rarely go there on my way home... Buying Israeli craft beer is one of those things I think of doing but never do. Yesterday, while walking down Agrippas Street on the way to get a new stock of coffee for my French Press* before going home, I was drawn to the beer. So, I gave in and bought myself those three bottles seen above. It was hard to choose. I was tempted to buy six, all different, but it was risky enough having three glass bottles in my bag. I asked the guy at the cash register to bag each separately, and then I tried to stabilize them with the blue and gold (to cheer for Jerusalem Big Blue Lions) pom poms for the Israel-Bowl XII. And then I went to Power Coffeeworks for the ground dark blend coffee. There wouldn't have been room in my bag for three more bottles of beer. Will report/review the beers in a future post, Gd willing. 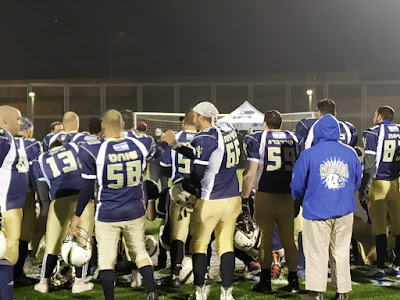 Last night Jerusalem "Big Blue" Lions, reigning champions for the past two years, showed its superior... everything... in the semifinal game against the Tel Aviv Pioneers. 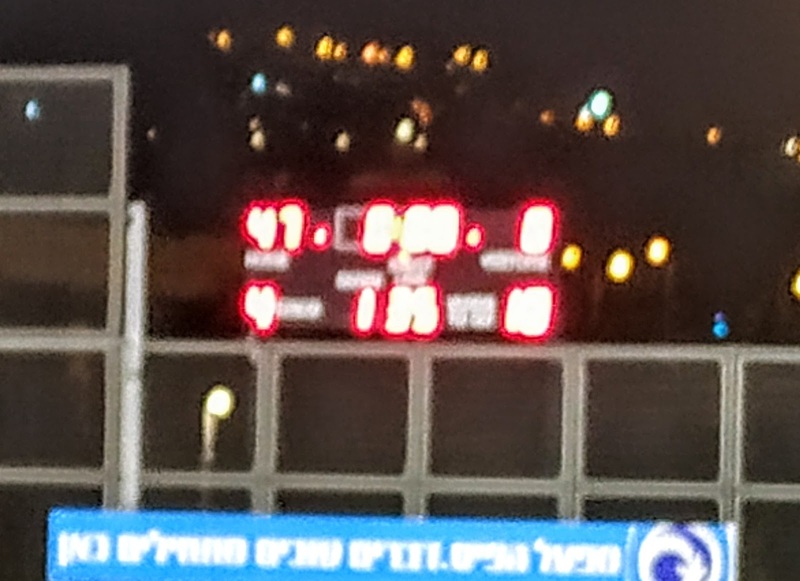 Big Blue won, 47:8. Just two years ago, Big Blue had met the Pioneers in the finals, a game that could make a great movie screenplay. In that legendary game, Big Blue was behind until they started inching forward in the final, fourth, quarter. Until then, it looked like we hadn't a chance. 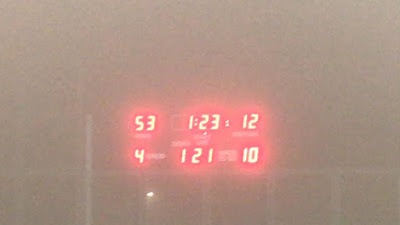 Then, only six, yes 6 seconds to the end of the game we tied them. The crowd went berserk and could hardly be held back. We beat them in overtime, yes, just like in the movies. Last night's game was different. This season's Pioneers aren't the same team that we played against in 2017. 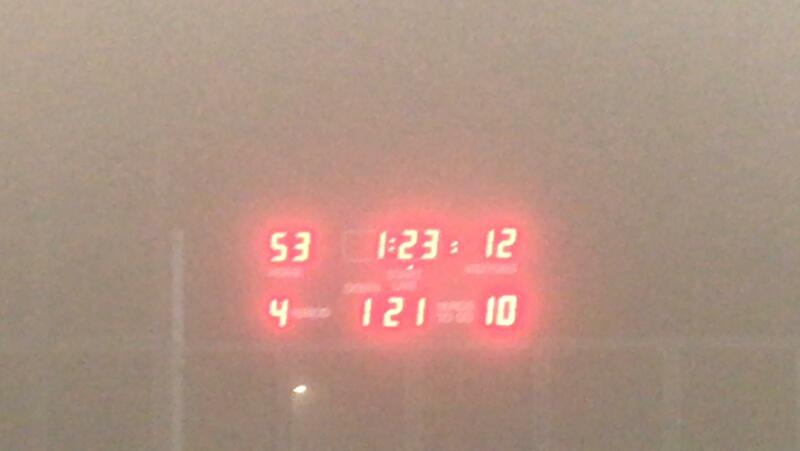 They started pretty well, but couldn't keep it up for the full four quarters. 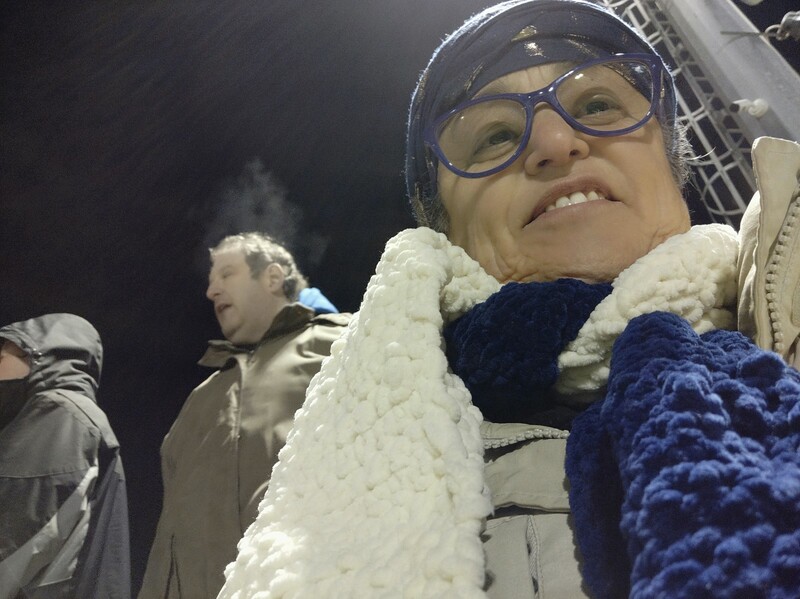 There was a nice supportive festive atmosphere in the stands watching the game. The fans are a real mix of Israeli society, as are the players. And there's a wonderful feeling of family, too, among players and fans. 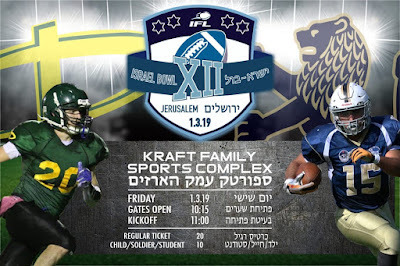 The Jerusalem football games take place in the Kraft Family Sports Campus, under the Ramot Junction. BTW, the Kraft who donated money for the fields is Robert Kraft, owner of the NFL Patriots which just won the Super Bowl. 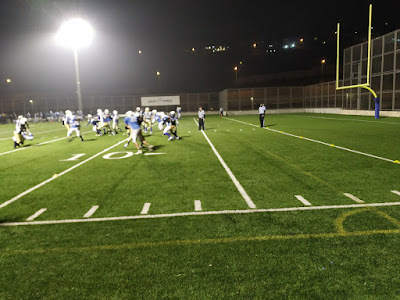 BTW#2 Head Coach of the Jerusalem "Big Blue" Lions is my son. I can brag, right? 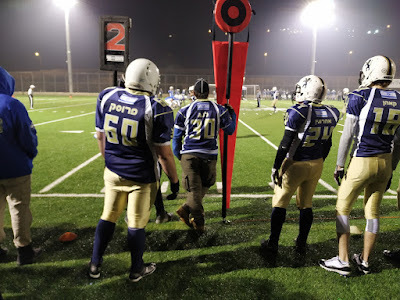 Next week is the Finals of the 12th season IFL Tackle Football. Yaala, BIG BLUE! Last year's finals against the Petach Tikva Troopers. There's a good chance that we'll be playing them again, next week. A few months ago, a neighbor invited us to meet some friends of hers, who were visiting from abroad. 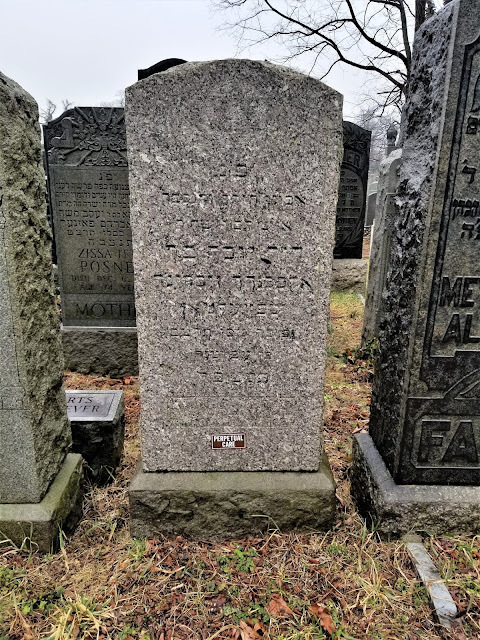 They were Yohanan Petrovsky-Shtern and his wife. 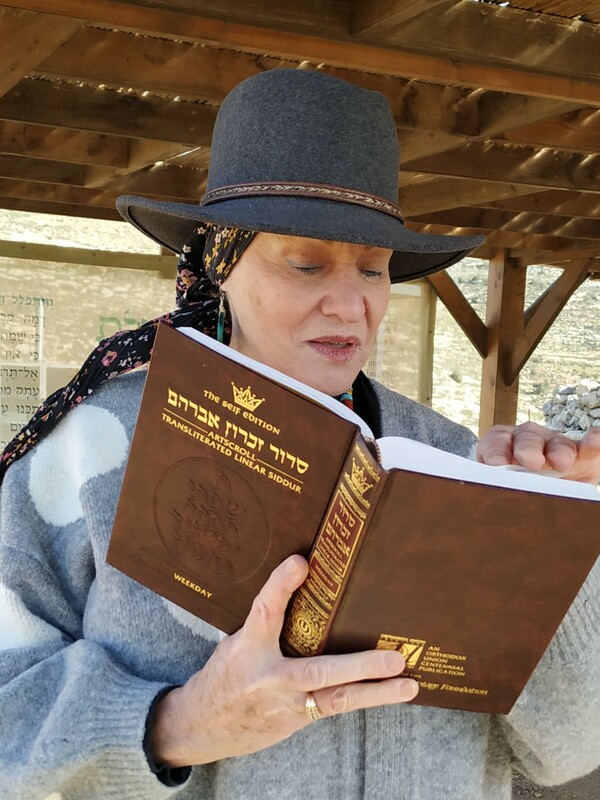 Yohanan Petrovsky-Shtern is the brother of Katja Petrowskaja, the author of Maybe Esther-A Family Story We found them to be charming, intelligent and fascinating people. And then a few weeks later, my neighbor gave me Petrowskaja's family memoir/history book which is totally amazing. "Maybe Esther-A Family Story" tells not only about Katja Petrowskaja's family but about herself, too. She grew up in the Ukraine not knowing all that much about her family's history. There were things like the great-uncle Judas Stern who was an assassin, a crucial tidbit which nobody wanted to talk about. Nobody was certain of her great-grandmother's name; it might have been Esther. Petrowskaja left the Ukraine as a young woman and, davka, chose to make her life in Germany. 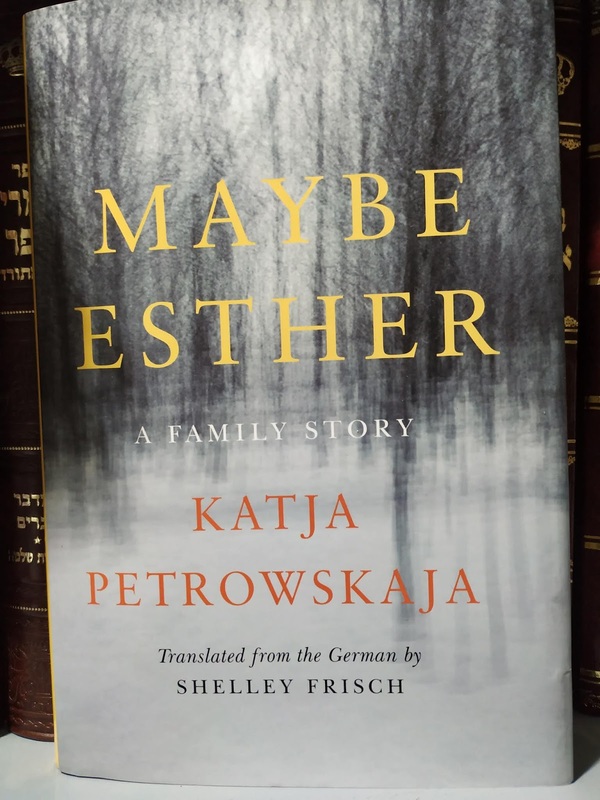 "Maybe Esther-A Family Story" was originally written in German. The English translation by Shelley Frisch is excellent. I have no idea how it compares to the original, but it's very readable and flows nicely. 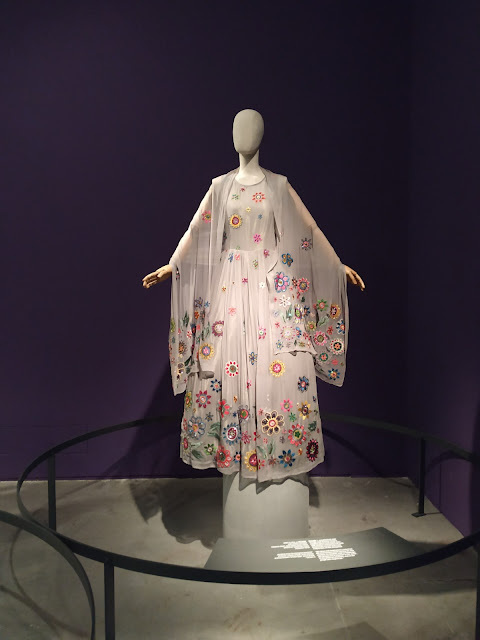 As a young woman, Petrowskaja attempted to distance herself from her Jewish Ukrainian roots, while her brother became a religious Jew. Their ancestors also went in different directions, and Petrowskaja tells of the challenges she took on to search for and document their amazing sagas. Petrowskaja is descended from teachers, but not the usual academic, science, math or history teachers. Her family taught the deaf and had unique techniques for teaching clear speech to those who couldn't hear. Of course, as with any Jewish Ukrainian family there are two large "elephants in the room," the Soviet Union and the Holocaust. Petrowskaja manages to deftly weave all of this together in a very readable tapestry. I highly recommend Maybe Esther-A Family Story. As we all know, there are sunsets, and there are sunsets. Many are forgettable, just signs that daylight is over, and we'll have to wait until the following morning for the sun to rise. There are even days when dark clouds and rain, hide sunsets, sunrises and even the sun itself. Or on rare days we're treated to the most Gevaldik and amazing sunrises and/or sunsets. Today's sunrise was one of those beauties. Honestly, I was taken by surprise. On my way home, sitting quietly in the bus in my favorite front seat, as we were traveling from North to South in Shvut Rachel, lazily I looked westward out of the window trying to see my house. And then suddenly WOW, Super Wow, the most Gevaldik sunset, bright round orange sun was staring right back at me. This photo is totally "untouched." I didn't edit it at all. Gd is Great for sure. I do blog a bit less than previously. No longer do I skirt the OCD daily posting on both blogs, even when it's done by writing in advance and setting up the post to be published on a future date. 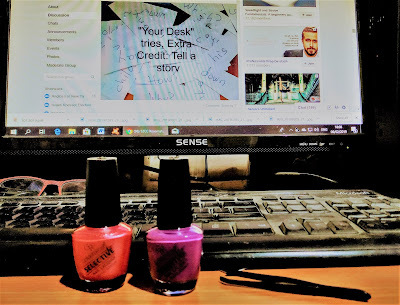 Now I blog less frequently and rarely on both blogs, this one and Shiloh Musings, on the same day. Blogs for me are the ones we publish on our own "sites," not when using the "blog" option on conventional mainstream news sites. That's another genre completely. 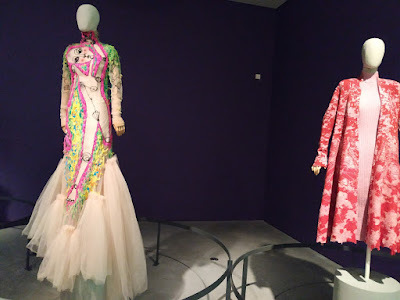 Over a decade ago, bloggers from all over the world developed a community, visiting, commenting and even promoting each other's blogs in a few different "blog carnivals." There were some Jewish ones which I was involved in, and I'm still friendly with other bloggers I met through these "carnivals." 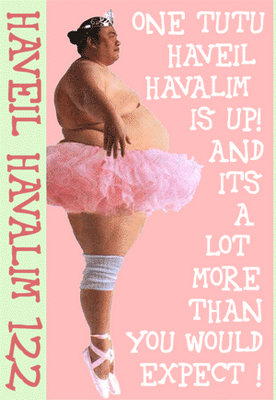 Havel Havelim was the biggest of all and continued for many years. 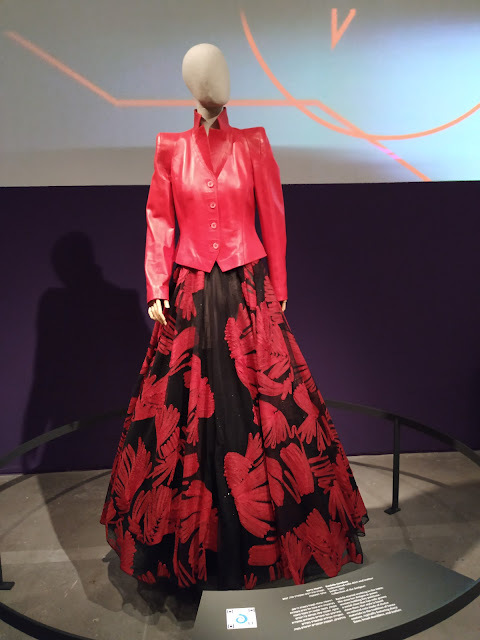 I still use the name when posting blog "roundups." Very few of the blogs from way back when are still active, but there are some interesting, well-written blogs. Here are a few posts for your reading pleasure. Please read, comment and share. And if there are some blogs you'd like to recommend, then list them in the comments here with full links, thanks. 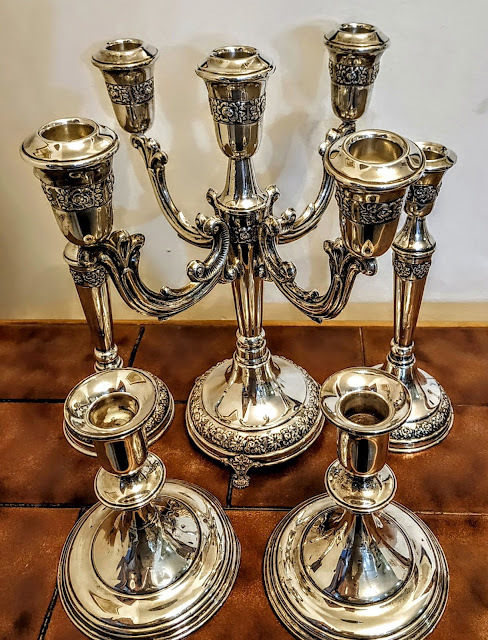 Listed below are titles of blog posts about Israel and Jewish topics from a variety of blogs. Click to read and enjoy. Enjoy, and keep on visiting and commenting on blogs. 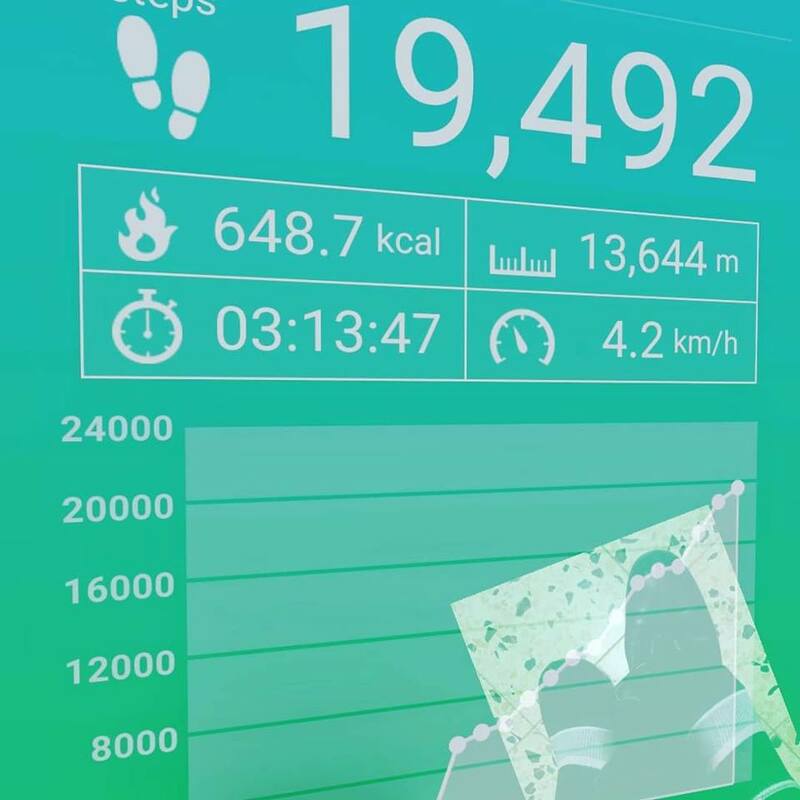 Actually, by the time I went to sleep around midnight, I had reached 19,542 steps. Yes, that may be a record number of steps for me. 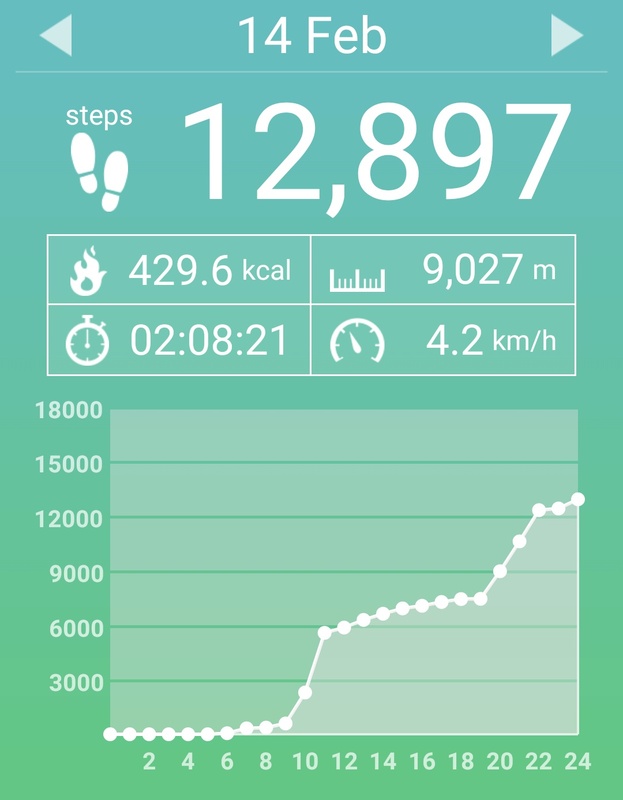 I use the simple "pedometer" app on my phone to keep track. Except for when my phone is charging, I have the phone on me, so every step counts. My rationale for that is that since every sip, taste or bite of a food counts for adding calories, then we shouldn't be shy about counting those steps, whether to the laundry room, refrigerator or even the loo. When you're setting up* your pedometer, make sure that it's sensitive enough to count all those very short "walks." 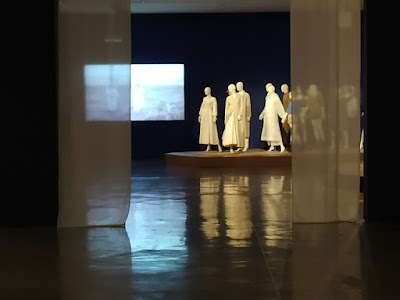 Once after a few hours in a museum, I discovered that although I had done a lot of walking, my pedometer had ignored most of it, since they were short walks from picture to picture, exhibit to exhibit. I know that the 10,000 steps a day benchmark has been pooh poohed as not very significant, but that's not really true. Once you start keeping track of your steps, you'll discover your own personal benchmarks, and for many people, davka, 10,000 steps is a good number to aim for and later top. As you may know, I'm no youngster, and I'm overweight and not in perfect shape. So managing almost twenty thousand 20,000 steps in one day is quite impressive, as is my average, which recently has been twelve thousand 12,000 or more. Friends ask me how I do it, without damaging myself. 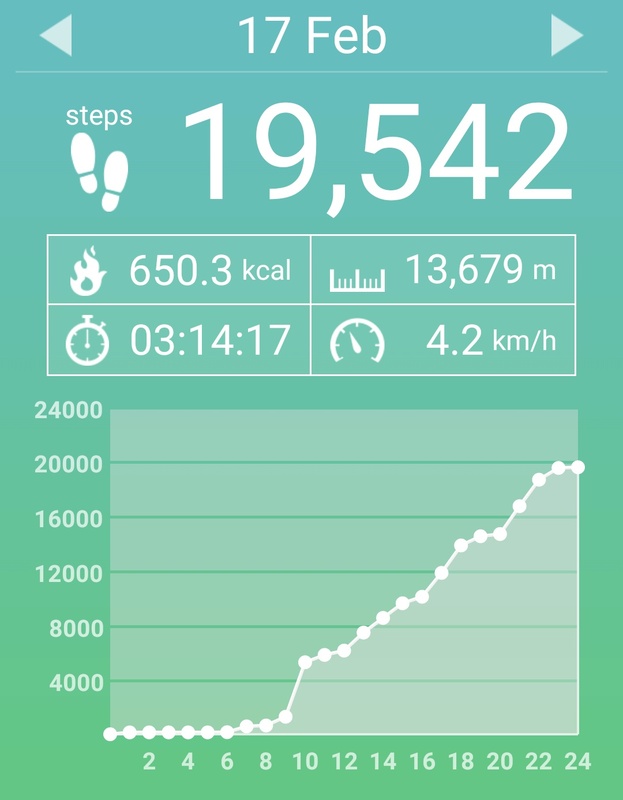 If you look at yesterday's record, you'll see that I was on my feet most of the day, didn't walk all that quickly and only had three "long" walks. And, thank Gd, it all added up. Below is a more "average day," and you can see that I was quite sedentary for quite a long period of time. Two long walks of about 4,000 steps each, one at a really good pace, made up for two-thirds of the day's step total. That means that I got in over an hour of good physical activity that day. The key to my approach is to exercise in small quantities, not to strain the body at all. If you're not in good shape, from injury, age, illness whatever, it's very important not to risk injury. But it's also extremely important to maximize activity. For many, that's a very fine line. "Anybody able to walk tonight/tomorrow morning? Please, pretty please..."
I don't always find someone, but not only does it help me, my friends enjoy it, too. Instead of chatting over coffee and cake, or not seeing each other at all, we really enjoy our friendly walks. There are people who use the walking time to talk on the phone, but to get full benefit, swing your arms and get a "headset" if you're going to have a "long distance partner." One of my walking buddies uses walking sticks to be steadier and give more upper body workout. What do you do to make fitness more fun and doable? *You also must get your step length accurate. A good way of doing it is to actually count ten or twenty steps in your head while walking and then check if the pedometer agrees. If the pedometer says you've taken more steps, then increase length; decrease if it doesn't credit you with enough steps. 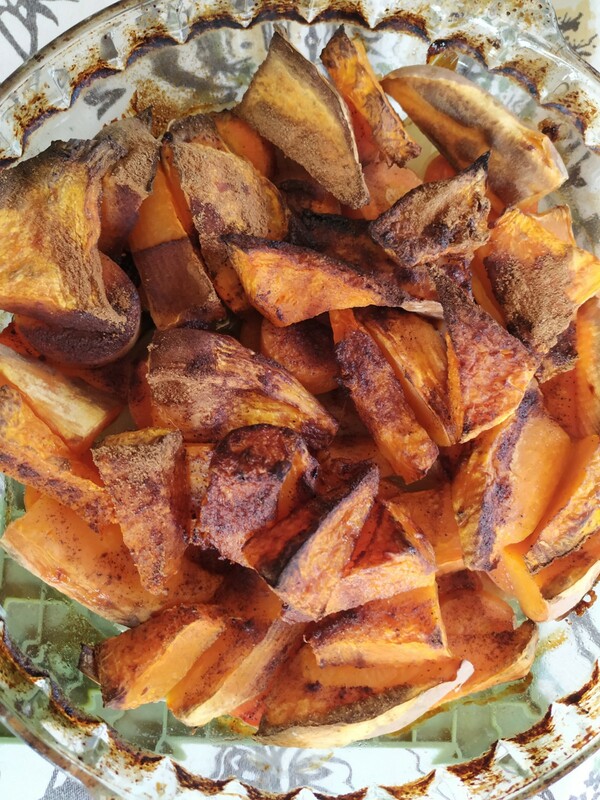 When I have an oven, not something I take them for granted*, baked vegetables are on the menu. 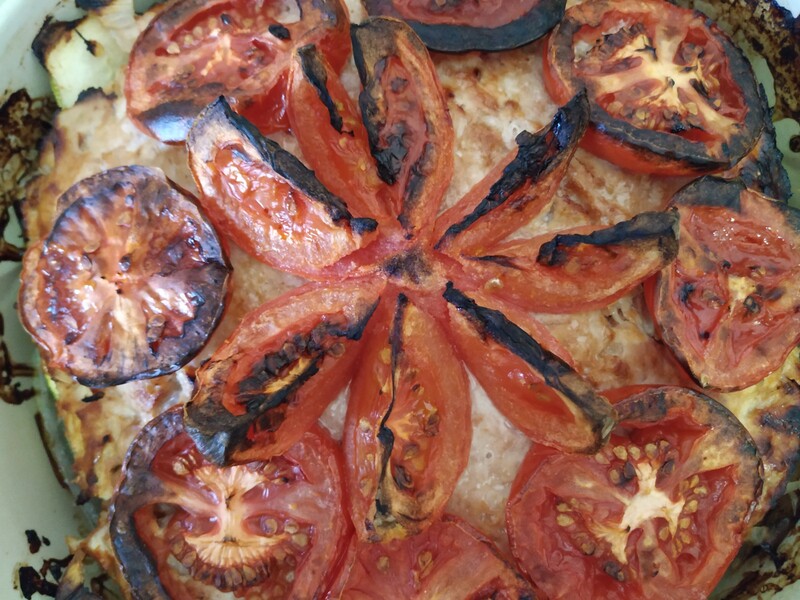 I have a variety of bake and serve oven pans, so that even the simplest of baked vegetables can look very fancy. The photo on the right shows "orange vegetables," baked with just a bit of cinnamon and oil. On a "bed" of onion slices, no need to cut exact anything, I placed carrots, sweet potatoes and pumpkin in that order. I bake them in a medium oven, heat from the bottom, until they look baked and are soft. Tonight's main course is pretty much a "one pot meal," besides being "bake and serve." It doesn't include any carbohydrates, so if you eat carbs, have them on the side with salad. I layered onion and squash, maybe eggplant, too, on the bottom of the baking pan. 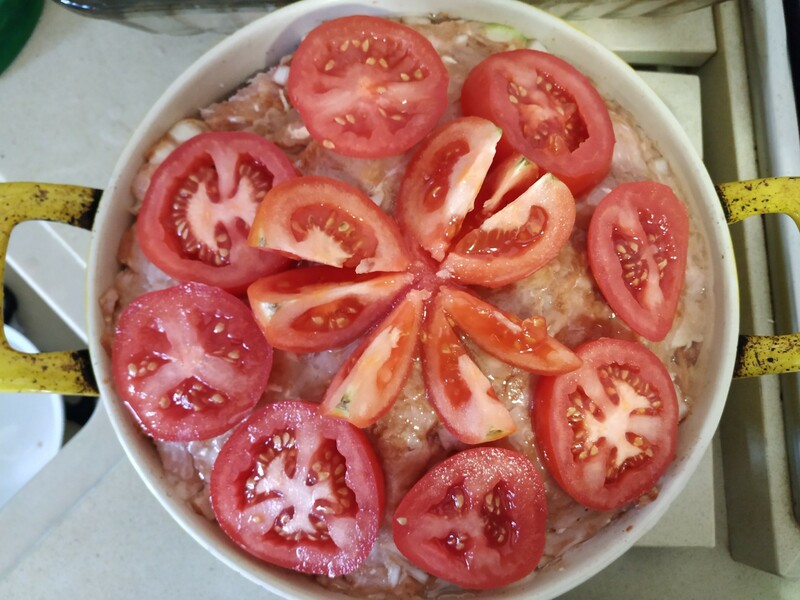 I used chopped/minced turkey (500 gram, just over a pound) with onion and a small 100 gram container of tomato paste, plus garlic. Spread the turnkey on top, with a large spoon and then, as you can see, top with fresh tomatoes. I then added just a spoon or so of vegetable oil and then baked it in a medium oven, heat on top, until it drew from the sides of the pan. You can substitute ground meat, beef, chicken or a combination. Consider it a version of a meatloaf or musaka. Cooking should be enjoyable and creative. *During the year before our kitchen was renovated, we didn't have a functioning oven. 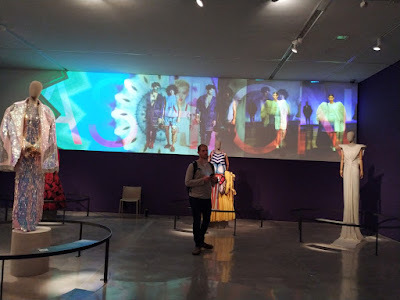 I've been through the Fashion Statements: Decoding Israeli Dress Exhibit in the Israel Museum a number of times, and each time I notice more and enjoy it more. It's closing on April 6, 2019. Here are some pictures I took there the other evening:. Which is your favorite and why? There's no Groundhog Day in Israel. We know that we're having a good winter when we see these flowers blooming. 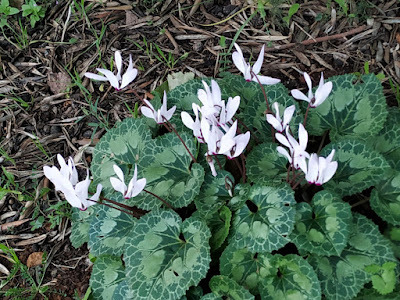 The Cyclamen (Rakefet) is a hardy root, that spreads easily. The flowers pictured here are from my garden. A number of years ago, someone gave us one as a gift. When it dried out and died, I put it in the garden, and in good winters it blooms. You can even find these flowers blooming in stone walls or around stairs. In a couple of months, when the rains cease and the air gets warm and dry, they will die... 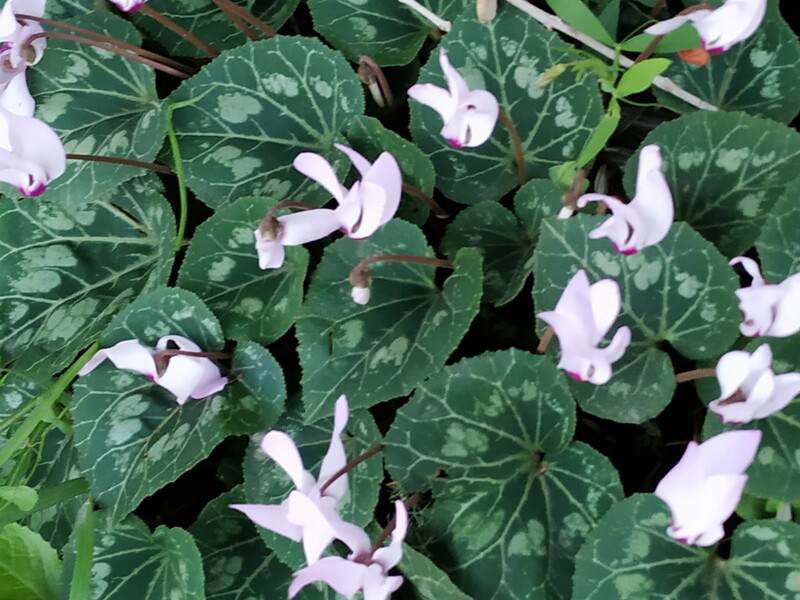 But next winter, Gd willing, if there's sufficient rain, even more cyclamens will bloom. 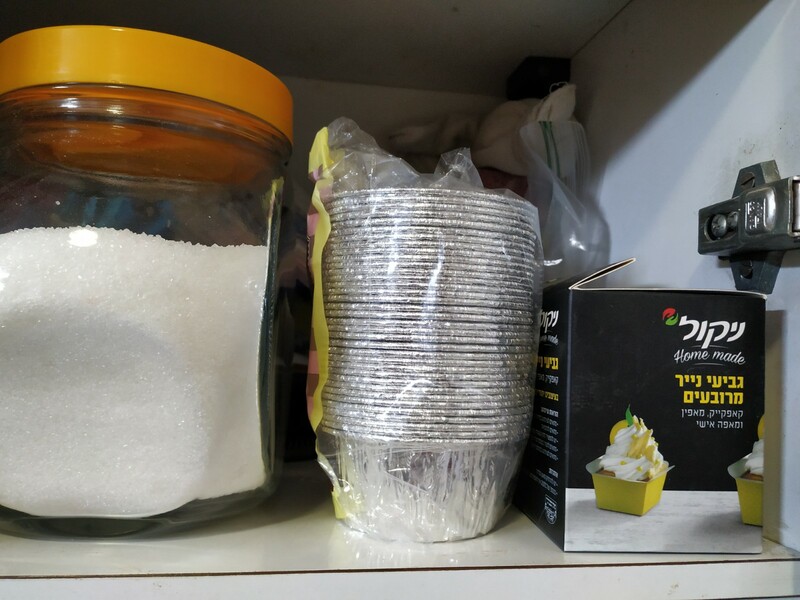 Purim and birthdays from Adar, when only one, are all celebrated in Adar Bet. Rosh Chodesh Adar Bet is another two day special. 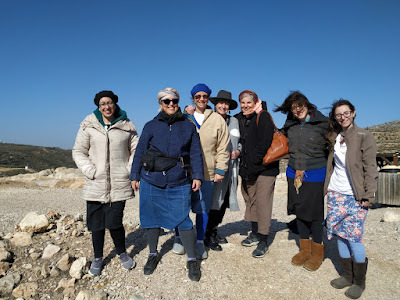 I took a "poll" among the women who come most frequently to our Rosh Chodesh Prayers, and they voted that we doven together at Shiloh Hakeduma, Tel Shiloh, on Thursday, 30th of Adar Alef, 5779, March 7, 2019, 8:30am. 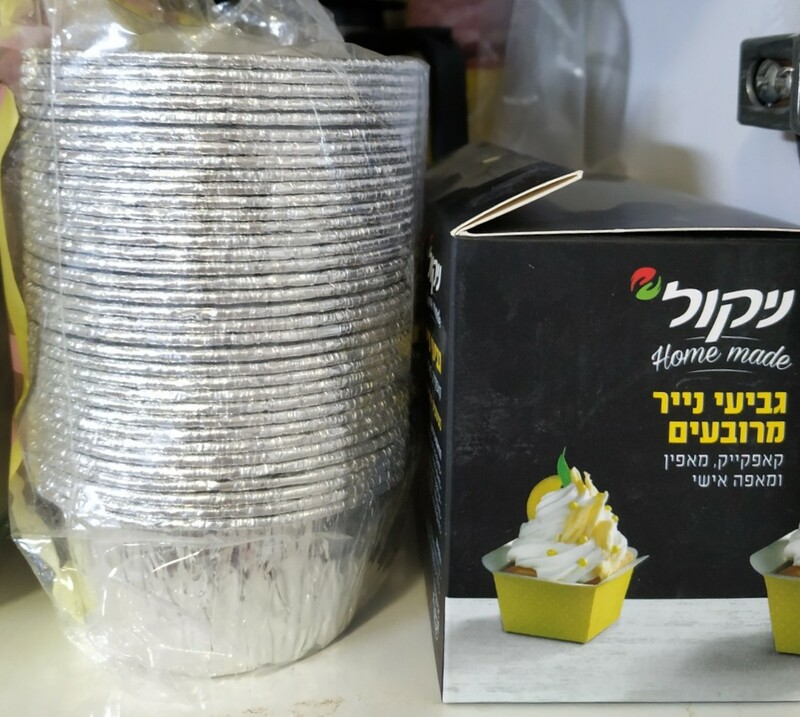 Today when I was in Shaar Binyamin shopping in a variety of stores there, I came across busy mothers already getting costumes for their children to wear on Purim. It's barely Adar Alef. There are five weeks to go before Purim! Rosh Chodesh, first of the Jewish Month, is the traditional women's holiday. So, it's really the perfect time to take some time specially for you, ladies. 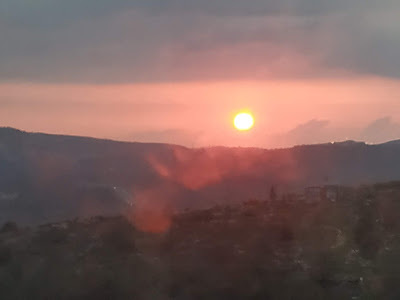 Join us in Rosh Chodesh Prayer. We pray Hallel together outloud, and the rest of the prayers are said silently. 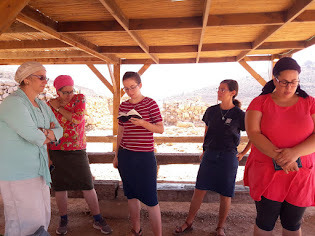 There will be a tour of the Tel and Divrei Torah, Gd willing, in both Hebrew and English. For more information email shilohmuse@gmail.com, with "Rosh Chodesh" as subject. 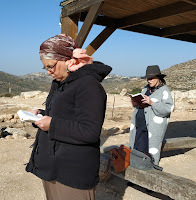 Unlike many other Biblical/Jewish sites, there's no debate as to whether Shiloh is Shiloh. 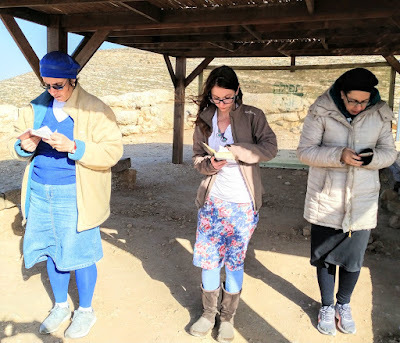 Shiloh Hakeduma, Tel Shiloh, is a recognized Israeli tourist and archaeological site. It's open on weekdays, offers guides and special activities for the entire family. For more information, contact them directly at visit@telshilo.org.il, or 02-5789111. Friday afternoon, I decided to make apple compote. I had hoped that it would distract me from eating cake on Shabbat for dessert. First I cut up a bunch of apples, keeping the peels on, and put them in a pot. 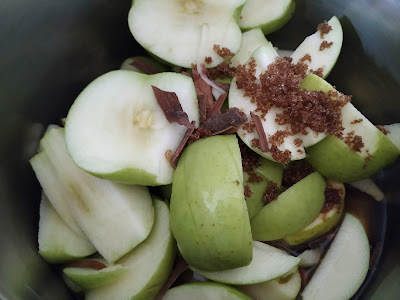 Then I added cinnamon bark, though the ground cinnamon would have been fine, too. For a bit more flavor and sweetness I added very little dark brown sugar. While it was cooking, I got inspired and decided to add some pitted prunes. 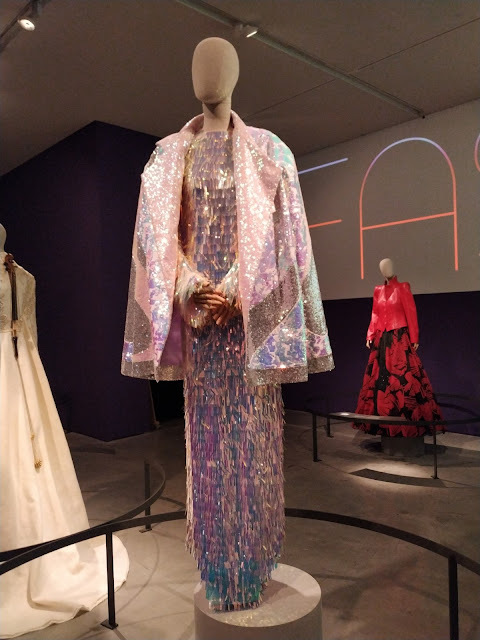 Our guest and I absolutely loved it. My husband was happy with the cake and isn't a fruit lover. 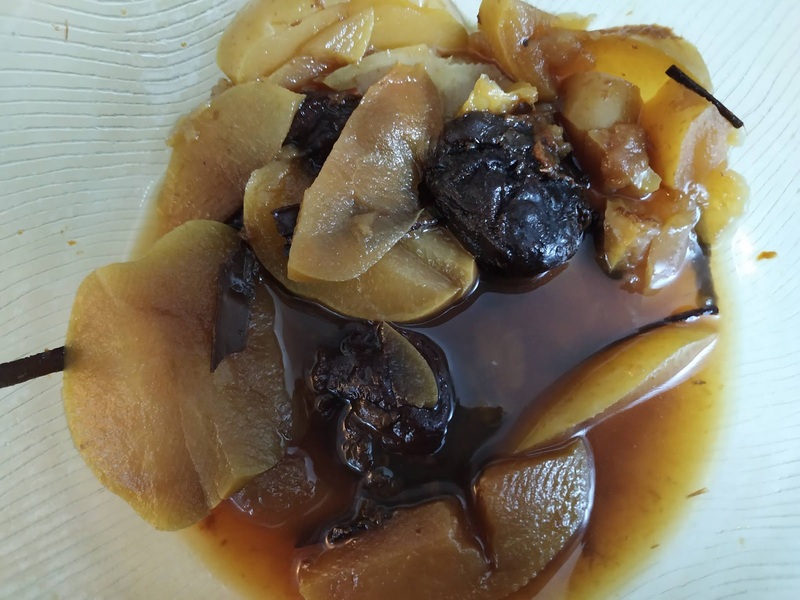 The prunes added so much to the richness of the flavor, and to be honest, if you're adding prunes, leave out the sugar. BTW prunes have more flavor than raisins. Now that I have four burners, bli eyin haraa, I ought to remember to make compote more often. Eat warm or cold from fridge. The foggy night in the new Kraft Family Sports Campus didn't fog up two year reigning champions, Jerusalem "Big Blue" Lions last night. 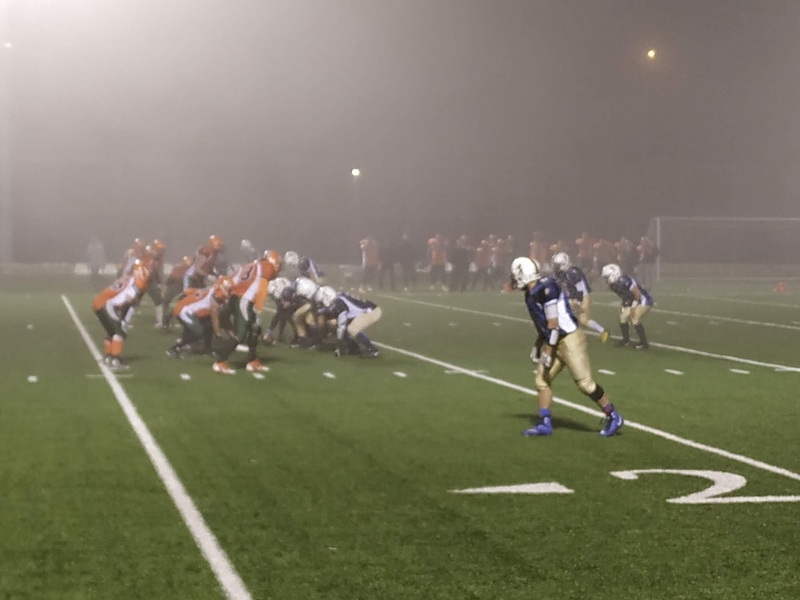 In a very tough game against the Judean Rebels, the Lions showed their superior playing power. The next game is the semifinals in two weeks. Gd willing, we'll win that one, too, and then on to our third National Championship. 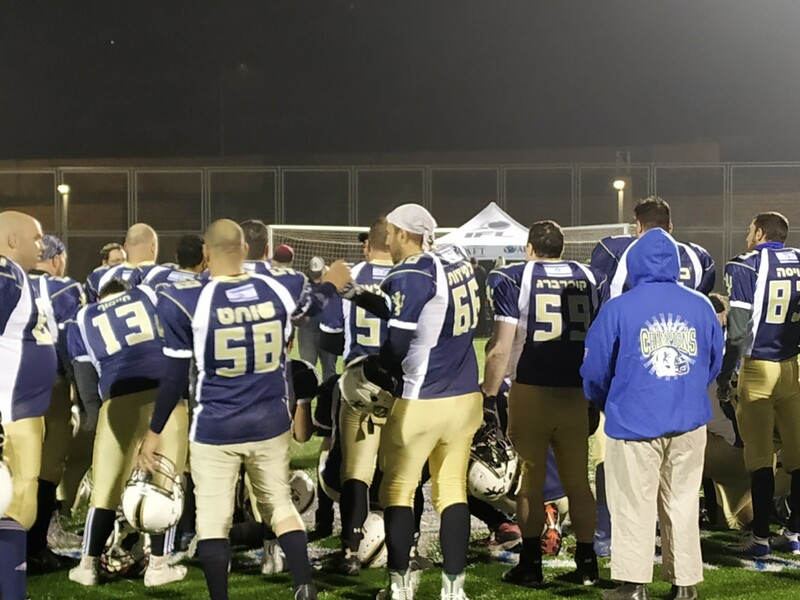 For more information about upcoming games and American Tackle (and flag) Football in Israel, click here IFL. This year has been an exceptionally blessed year for rain, here in the Holy Land. 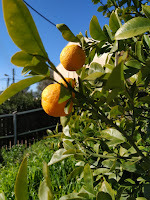 And in addition I had taken a neighbor's advice and watered the two barren citrus trees in our garden. One tree is a lemon tree I had bought well over twenty years ago, and the other is from a sapling one of our sons brought back from a hike a few years after we had planted the lemon tree. We'll refer to the second one as "the mystery tree." Over a decade ago, I remember seeing some small orange fruit on the mystery tree but don't remeber even trying to eat them. They were terribly small and hard. 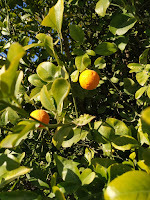 For the past few months I've been noticing a number of orange-colored fruit growing on the mystery tree. 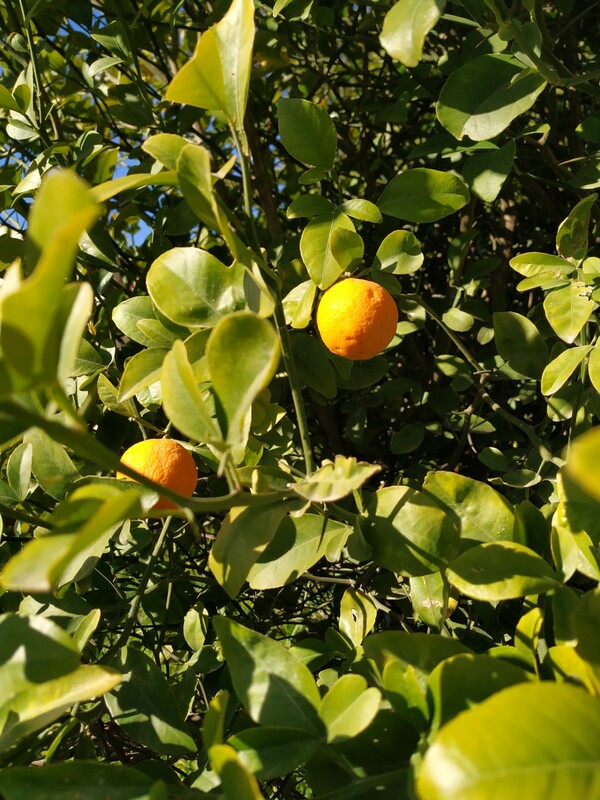 At first they seemed to high to be picked, but yesterday when I walked by, I could see that there were quite a few of these fruit low enough, even for me. So, today, after my morning walk, I went over to the tree and decided to take a better look. I picked one fruit from the tree, smelled it decided to take a bite. What could be wrong? They hadn't even sprayed with poisons. Yes, they're organic, completely organic. 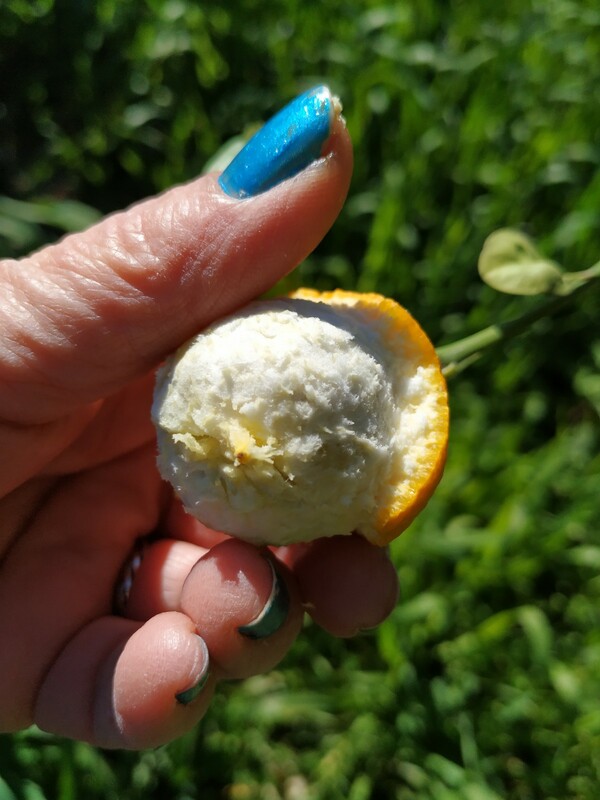 One of my guesses, due to size, was that they were some sort of clementina, which is a small tangerine, an easy to peel citrus fruit. Here in Israel the clementina is the first of the winter citrus fruit offered for sale, late summer, early winter. 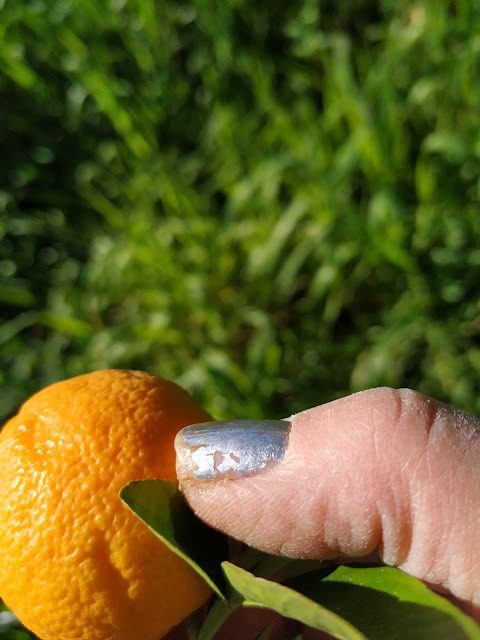 The clementina has a very thin skin/peel, thinner than any orange I'm familiar with. 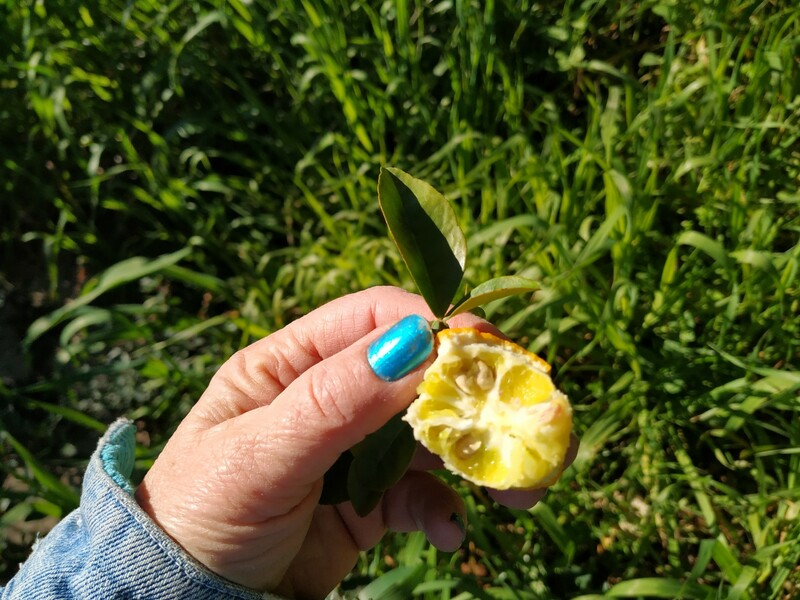 Test #1 This mystery fruit has a relatively thick skin for its size, but as you can see in the pictures, it's a tiny fruit. Now, I don't know if the mystery fruit is supposed to be small, or if the difficult dry and cold climate here has damaged/stunted it. Test #2 was the taste test. The mystery fruit tastes something like an orange. I'll leave them on the tree a bit longer and taste them periodically, to see if they get sweeter with time. Of course the challenge is to pick them before they rot on the tree. I'd be grateful for advice, thanks.